Art therapy is a form of psychotherapy that uses art as a way to communicate. It allows people to use art materials for self expression and reflection in the presence of a trained art therapist. 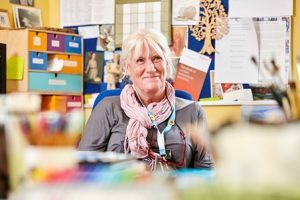 Art therapy can be used to help address the complex issues that can arise following the diagnosis of a life limiting illness. Sometimes it can be hard to talk about difficulties and feelings, so art therapy can allow people to express these in a safe environment, using art instead of spoken words. Your illness has brought to mind past issues or times in your life which you find unsettling. No matter how you are feeling, art therapy can help you express your emotions, in an atmosphere of support and understanding. Sessions are weekly, they last for one hour, and they are done on an individual basis. The sessions are held in the art therapy room in the Sunflower Wellbeing Centre. A range of art materials are available for use, and you can choose to use the time and space in the way that feels most comfortable for you. Some people like to paint quietly, engaging completely with the materials, while others may feel the need to talk more—most patients do both. The role of the therapist is to be a facilitator and listener rather than an art teacher. The creative process is the focus of the session, and it is through this framework that feelings can be acknowledged and worked through.